Learn The Cause Of Problems That Make Floors Uneven In Houses. Avoid Costly Repairs For Leveling. Because of flooring issues in houses, many structures need leveling. Houses in Dallas or Fort Worth requiring slab foundation repair or pier and beam work should be fixed as soon as problems develop to stop floors from sloping. Find out what it costs and the causes of trouble. Uneven floors are issues in homes and show distinctive signs of damage or sagging. While houses with floors that are not level can cause trouble with slab foundations, including posing a danger to individuals who have physical disabilities, are elderly or are very young. What’s more, when floors slope, they can be uncomfortable to walk on. It’s important to learn the causes of foundation problems and floors that aren’t even, and avoid costly repairs. 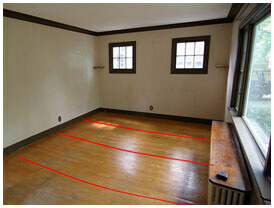 Unless your house is severely damaged, it can be difficult to see just how our of level the floors actually are. Foundation or house leveling is important because it will present flooring from sloping. Find out about any fees involved by calling HD Foundations. Issues develop with all types of foundations, including pier and beam foundations and concrete slabs. Fixing house foundations right away is best as many Fort Worth and Dallas, TX homeowners well know. To learn more, review information on sagging floor foundation problems. Quite often, calling a contractors for slab foundation repair service is the best solution for dealing with uneven floors and other issues related to foundations. To take a very unscientific approach to determining if the floor and foundation of your pier and beam structure is uneven, or if slab foundation repair issues need to be fixed, do this: Roll a large marble across the floor and see if it rolls straight across the floor or goes downhill. While it’s a poor way of determining exactly how bad your foundation problems is, it will quickly allow you to find out if your floors are uneven. It will even give you a very rough idea of how much they’re sloping. The only sure way to know exactly how uneven your floors are is to contact a foundation repair contractor like HD Foundations and have them stop by to evaluate your property. It’s important to call a qualified foundation contractor because experts like us use state-of-the-art equipment to measure your various floor levels, accurately determine how out of level your house floors are, and find out exactly what’s causing the problem. 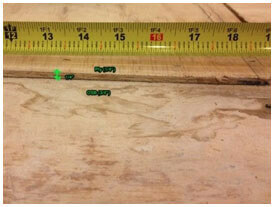 HD Foundations uses Zip levels, which are extremely sensitive and highly accurate. You’ll want to review foundation repair solutions that can help stop sloping floors. If you’ve got problems, you’ll want to have it resolved as soon as possible and avoid high charges for repairs. Call the contractors at HD Foundations. What Causes Floors To Have Issues? Depending on whether you have a concrete slab or pier and beam foundation, different things could be affecting your foundation and floors. Learn about the six common problems with slab foundations and what’s causing an uneven appearance in the flooring of your house. The ordinary causes of foundation problems include: (1) poor structural design that creates uneven floors (2) improperly compacted soils under your house or structure that can be costly to fix if your foundation is damaged (3) soil movement and (4) excessive moisture under your house caused by inadequate foundation draining or plumbing leaks. In addition to making your floors buckle and uneven, these things can do a lot of other damage. In determining what slab foundation repair costs, as well as pier and beam prices, remember that it’s are based on the amount of foundation damage your house has and how out of level it is. Prices vary so be sure and find out exactly what your final bill will be. In the Dallas and Fort Worth area, foundation repair costs average $5,000, but fixing slabs can exceed $12,000. Apartment complexes, town homes, schools and larger properties with concrete slab or pier and beam foundations may cost more to repair due to their size. In some cases, the price for leveling a house can be well over $20,000. Concrete piers or steel foundation piers vary in cost, and that can affect the final fee for restoring your foundation, too. The only way to know for sure is to speak with a professional who can offer solid advice. When Is Foundation Or House Leveling Needed? You’ll want to have your property mended as soon as you see problems with your floors. The quickest way to resolve your issues and level your flooring and house foundation is to contact a reputable foundation repair contractor. They’ll check out why your house isn’t level and what do about uneven floors. They’ll perform a foundation inspection, too. Qualified experts know what to look for and have a good idea of where your problems are originating. A repair specialist that services concrete slab foundations may recommend enlisting a licensed plumber to perform a hydrostatic plumbing test to see if you have leaks of any type that are contributing to your sloping floor problems. Regardless of what’s causing your floors to not be even, a foundation expert can quickly determine what’s needed in order to eliminate your concerns. If house leveling is required, HD Foundations can help. In the event you need steel or concrete piers, they can be installed to stabilize and strengthen your house. 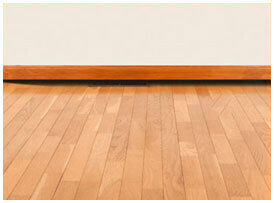 To find out why your floors are warped or appear extremely uneven, schedule a free foundation estimate online today. Or, just call the local contractors that offer solutions.